Fast forward twenty years; today, Phul Kumar Lama is a seasoned professional in the coffee business. His company, Mt. Everest Organic Coffee, exports tons of coffee every year to Japan, among other countries. However, his journey hasn’t only been that of a trader, but also an integral part of the coffee industry that burgeoned in Nepal in the last two decades. Just last month, his company launched a new product, under a new brand name – Trekkers. An easy to prepare, packet of filter coffee, it is targeted to trekkers and mountaineers. The coffee can be prepared anywhere with just hot water, without a coffee machine. “Imagine having a cup of freshly brewed coffee in the middle of nowhere. Trekkers is for people who would appreciate such a feeling,” says Lama describing the product his coffee-loving Japanese client would have surely appreciated. Lama had had the idea for three years, but because he couldn’t find the necessary packaging material, the idea did not materialize then. However, it is not the only time Lama had to wait in his journey with coffee – starting with the three years it took for coffee cherries to emerge from the plants he helped plant. Coming back from Japan, Lama went into an extensive research phase. After much studying and talking, he learned that two districts in particular – Gulmi and Palpa –were already producing coffee. To his disappointment, the production levels were quite negligible. The farmers were producing just enough to sell to a few Indian traders who stopped by seasonally. The existing coffee production was a result of a few government initiatives that were trying to promote commercial coffee plantation. The programs did find some success in convincing a few farmers. However, unable to find buyers, the farmers soon got disillusioned. During his time in Japan, Lama met a few people who showed interest in the prospects of highland Arabica coffee from Nepal. Hoping to sell to these Japanese contacts, Lama decided to buy the coffee from the farmers of Gulmi and Palpa. “I took a cautious risk by starting with only fifty kilos. I was able to sell all of it,” says Lama, recalling his initial days in the coffee business. His Japanese customers were delighted, and they promised guaranteed purchases from him if he could supply more. The problem: Lama didn’t have more to sell. Fueled by the excitement of new business prospects, Lama started to look for ways to maintain supply for his coffee export business. Around that time, Helvetas, a Switzerland based INGO was conducting a training on coffee farming. The two-week long training with twenty-seven other participants from 14 districts proved instrumental for Lama’s future. “By the end of the event, I had built good relations with three other participants– Dakeshwore Ghimire, Krishna Prashad Ghimire, and Krishna Prashad Pathak.”Ghimire had started Nepal Coffee Company in 1984 as the first coffee processing company in Nepal. They decided to work together to promote coffee production. “I realized production was the key. In almost everything our country has had a promising start, the reason for failure to build on it has been the inability to ensure sufficient production. It has led to compromised quality and has caused industries to eventually suffer,” says Lama. With his newly formed team, Lama started training programs and conducting dialogues with local farmers in three districts – Sindhupalchowk, Kaski and Kavre, the latter also Lama’s hometown. Some farmers in Sindhupalchowk and Kavre were already growing coffee. However the reason for choosing Kaski was different. Kaski, a place known for tourism, also provided a strong prospect for coffee tourism. In a few years time, Lama would explore this prospect as well. 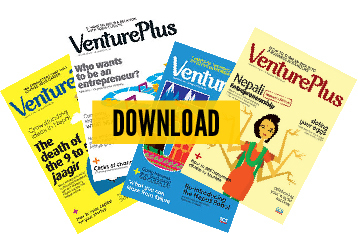 His team’s catch phrase was ‘jagga ra pakhura’ which basically meant – with land and ability to work, you (as in Nepali people) don’t have to migrate to Saudi countries, you can make enough here. The team went from village to village promoting the idea of self-employment and how coffee can play a part in it. “We started giving trainings on planting coffee, and also promoting the idea of commercial agriculture,” says Lama, adding, “However, the idea of commercial agriculture in Nepal is not simple at all. We learn in school that 80 percent of Nepalis are involved in agriculture; this is a misleading fact. Despite the number of people involved, their involvement in agriculture is mainly focused on sustenance; only what remains after consumption is sold.” Convincing farmers who hadn’t discovered farming as a source of substantial income yet was not their only challenge. Coffee, the plant they were asking the farmers to grow, bore fruit only after two and a half years. At that point, it didn’t seem like time was on their side. To overcome these challenges, the team worked on a system that would increase coffee production without hampering the farmers’ usual production. Their plots were segmented and coffee was planted in only one segment to start with. They also introduced intercropping – a system of planting fast-growing crops in between larger crops. Ginger and turmeric, plants that grew within a few months of planting, would compensate for the returns forsaken by the farmers. “One of the good things about coffee is that it can be grown almost everywhere. It needs shade, so jungles are ideal for growing coffee. Even sloped land is good,” says Lama. Planting coffee was making their land more productive, and more farmers started to notice. Still, the team’s objective was not only to convince the farmers. They knew the coffee needed to be of a certain standard for it to sell well. For that reason, they had to convince farmers to put up with another hassle –the then unfamiliar concept of organic farming. “The idea of organic was introduced by foreigners, we didn’t know what it meant,” says Lama. However, they did realize it was important, and not least for just marketing the product. So they worked on convincing farmers to use only natural pesticides, like sisnu, neem and garlic. But Lama had an offer that would justify the hassles to the farmers – a buy-back guarantee. He promised the farmers that he would buy whatever coffee they produced. The team also wanted to devise a mechanism that would ensure a long-term commitment from farmers. By the time the group arrived in Kavre and Sindhupalchowk, small groups of coffee planters were already existent. The farmers functioned in groups of twenty-five, and sold collectively to Indian traders. Noticing the functionality of the coffee producers’ group, the team decided to replicate it throughout the three districts. The team helped form the District Coffee Producers’ Association (DCPA), a collective of representatives from local level groups, and also Nepal Coffee Producers’ Association (NCPA), a nation-wide collective of district level associations. “These organizations were created to ensure the interests of coffee producers. It would mean security for the producers, and the industry,” says Lama. At first, the national level association was chaired by Dakeshwore Ghimire, with Lama as the Secretary. After six years, the roles were transferred to local producer representatives. Ensuring production was only the first piece of the puzzle. The cherries produced must be processed and turned into green beans before they are exported; processing meant investment. Machinery needed to be imported and people needed to be hired. Lama did not have that kind of money. The reason Lama started the travel company with his friends was because it didn’t need much investment. Also, when he bought coffee from Palpa and Gulmi farmers, he did not spend heaps to get it processed, and used a local grain hulling machine to get the job done. This time around, he needed a more permanent solution. So he hired two people from India who were familiar with the machinery. Together, they made their own hulling, polishing and grating machines. He also devised a way to move coffee between these processing steps, cutting out labor intensive processes. “Having learned the process, I figured it would be cheaper to build the machines. The inexpensive machinery has helped us equip farmers. Some processes like pulping, fermentation, washing and drying are now done by the farmers themselves,” says Lama. The production system gradually took shape, and is still helping Lama meet the orders of what is a rapidly growing industry. 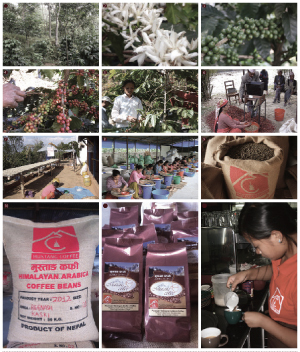 Around the same time, several other local coffee companies started their work with Nepali coffee. The initial group of four also went their separate ways and are now running individual coffee businesses. Dakeshwore Ghimire heads Nepal Organic Coffee Products Limited. Krishna Prashad Ghimire is the Chairman of a public limited company called Highland Coffee Promotion Co. Ltd. (HCPCL); farmers partly own this company. Krishna Prashad Pathak resides in America where he continues his work in coffee. Lama’s company –Mt. Everest Organic Coffee that started with the name Royal Everest Coffee Company, today exports green beans to Japanese companies like Ataka, Nippon, Kyowas and Vol Café, that blend, package and sell the Highland Arabica coffee. The company also has its own brand, Mustang Himalayan Arabica Coffee, that sells roasted coffee locally, the part of the business which is almost as important as the export part. “Forty percent of what we produce is consumed locally today, a significant growth from the time we started,” says the entrepreneur. Over the years, what was initially thought of as an industry that would depend on international demand has now been complemented by local consumption. Lama also owns three coffee outlets in Kathmandu – in Kupondole, Bakhundole and at the United World Trade Center (UWTC) building in Tripureswor. His decision to start selling coffee directly to consumers, however, was not an elaborate plan to promote local coffee culture. In 2005,the international demand for coffee dropped, and as a result of the buy-back guarantee scheme, Lama was stuck with 70 tons of coffee in his warehouse. 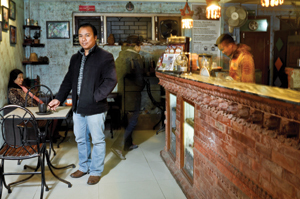 “I had to sell it before it went bad, so I decided to open up cafes in Kathmandu,” he says. The café in Kupondole is called Beans Café, the UWTC outlet is Mustang Coffee House, and in Bakhundole there is a coffee stall at the popular restaurant Bu Keba. Lama’s contribution to the local coffee consumption habits, however, is not limited to the three cafes. Mt. 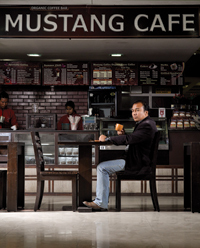 Everest Organic Coffee also supplies to cafés like Himalayan Java’s outlets – the first specialty coffee house in Nepal. The coffee he helped plant also brought other opportunities – like coffee tourism. Having already built good relations with Kaski locals and also with clients in Japan, Lama was able to bring Japanese tourists to villages in Kaski. With coffee fields as an added bonus to the natural landscape of the place, eco-tourism and homestay packages flourished in the region. “When tourists come to Nepal, they want to experience it and not just see it. We make them stay in locals’ houses, eat what they eat, and live how they live. Tourists appreciated that; how often do they get to play with goats?” says Lama. The homestays brought added income to the locals, and gave them another reason to keep planting coffee. It the past two decades, the local coffee industry has seen a lot of changes. There are 32,000 people from more than twenty districts involved in coffee farming today. The revenue from the export of coffee in the fiscal year 2010/2011 alone amounted to Rs. 8,50,00,000. There are more than thirty companies involved in the coffee industry, of which twelve are production companies. There are ten coffee estates, and hundreds of coffee shops in nooks and corners of cities like Kathmandu and Pokhara. However for Lama, there is more to be achieved.“I do not see coffee as just another commodity we sell. It can be a tool for our country to achieve economic prosperity,” says Lama. Besides maintaining farmers’ compensation, there are other reasons why Nepali coffee cannot afford to be competitive in the international market by bringing the price down right now. It commands a premium price for several reasons– Nepali coffee has lower level of caffeine in comparison to the standard coffee traded in the international market -this makes it more expensive; the size of the beans is also smaller than most coffee beans, which means it requires more yield to produce equal amount of coffee in weight; and local economic factors that haven’t yet been able to generate economies of scale also contribute to the higher prices. The premium price that Himalayan Arabica coffee has to impose means that it can only cater to a niche market – the sort of market that would prefer the exclusivity of coffee grown under the Himalayas. The dilemma is that increasing supply could take away the exclusivity and even drop prices, and not increasing supply would mean that the producers can’t benefit from economies of scale. Lama’s friend from NCPA days –Krisha Prashad Ghimire disagrees with this clash. “The amount that Nepal produces today,425 tons per year, is minuscule amidst the 800,000 tons produced globally. Even if we produce to our full capacity, we will still be able to maintain our exclusive appeal,” says Ghimire. The Government of Nepal has introduced ‘Himalayan, Specialty, Nepal Logo’ – to certify that the coffee is from Nepal. However, to get certificates like ‘organic’ is still a challenge for local coffee companies. Certifying their product with an organic guarantee system requires a lengthy and expensive application process. The certification is provided by an international organization called IFOAM (International Federation of Organic Agriculture Movement), and the process takes up to three years. Coffee’s connection with the forest has also helped promoters of coffee to connect it with conservation. In Pokhara, soil erosion of the Valley hills has been a major problem which has caused the lakes to shrink in recent decades. An organization called Rupatal Begnastal Jaladhar Yojana has been promoting coffee plantation in the surrounding hills to prevent soil erosion. Lama and his friends, including Krishna Prashad Ghimire, were involved in the program during their work in Kaski District. According to Ghimire, hydro projects are also looking into coffee plantations near damns to prevent soil from eroding into reservoirs. Speaking of the benefits of planting coffee, Ghimire also adds that it has been proven that coffee plants produce the most oxygen after the pipal plant. Coffee has asserted itself in our society at different levels through the work of people like Phul Kumar Lama. Even the government, which has shown a keen interest in coffee’s potential, allows a rebate of 2% on coffee exports. A government organization – National Tea and Coffee Board, conducts research and other supportive programs to develop coffee production. It has also declared Mangsir 1 as National Coffee Day. However to achieve the actual potential, Lama thinks the industry needs a concrete government policy, a view shared by Krishna Prashad Ghimire. Ghimire says, “The industry needs a government policy that defines the framework for investment, quality, pricing and other practices. The policy will help channel investment, monitor quality, help reduce the cost of production and even help bring in necessary expertise from abroad.” It might also help resolve the catch between price and supply, on which various stakeholders have differing views. In the last two decades, the industry has been able to gain unprecedented traction – without government policies. Individual efforts, initiation and vision has helped fuel the industry till now. The hope that Nepali coffee will keep invigorating people like Lama, as they weave the success story of Nepali coffee. I read plenty articles on coffee farming, production and exporting to abroad. But, I don’ find articles on coffee wastes such as coffee pulp, coffee husks and coffee leaves. What the coffee producers are doing with these wastes? If the coffee producers are interested to know more about the economic benefits in terms of energy to the kitchen or in terms of soil amendment, please contact us. Our contact numbers are 4361574, 9841419021, FoST, Thamel. Hello there, I’m interested in knowing more about using coffee waste for home energy solution. Where exactly is your office in Thamel? I’d like to come and have a chat. Part of my job is to promote small-scale energy solutions and social entrepreneurship. Thanks. My local number is 9818854253.